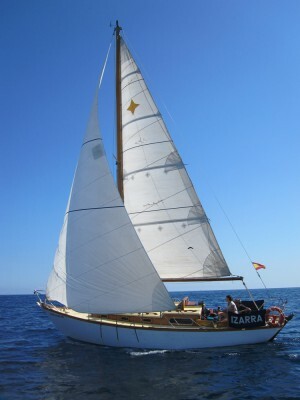 Izarra’s design represents an improvement in regard to the famous Twister series that Kim Holman designed during the 60’s, such as cruise and race boats. With respect to a Twister, Izarra presents softer and less deep lines, which are more appropriate for a cruise. Its sailing is sweet and calm, and doesn’t wet the deck even if the sea is turbulent thanks to its excellent weigh distribution. The Gallart Shipyard built it as sturdy as it was possible for its first owner, a commercial airline pilot. With all of hat, Izarra has beaten much more sporty ships in races, even in one to one challenges.